Appearance: Yugi is a hansome looking guy whose outfit consists of the standard male Domino Junior/Senior High uniform complete with a closed buckled collar. His extremely extravagant hair features multiple layers including long blond crooked, pointy locks for his fringe, the rest features a set of five large spikes and two smaller spikes colored black with a magenta sheen along the edges. 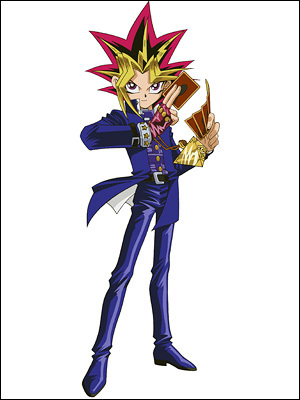 Personality: Yugi is an ongoing guy whose goals is to become a very good JFC fighter. He's a kind & warm hearted adventuruer that loves adventures with his friends, whose always cheering him on during his duel monster battles or dinosaur battles. He's a very determined individal who'll stop at nothing to become the best there is at JFC in a good way. His tie with his ancient Egyptian artifact, the Millenium Puzzle, makes him beleive in the heart of the cards & the heart of the dinosaurs. He also beleives there is a spirit inside the puzzle connected to his mind. He doesn't like theives who try to steal his puzzle for it's value. Biography: Yugi lived in his family's game shop, Kame Game, with his mother and grandfather. His grandfather taught him a lot about the game, Duel Monsters. Yugi, bullied by Joey and Tristan. Joey and Tristan used to bully Yugi. Joey even went as far as taking a piece of Yugi's Millennium Puzzle and throwing it into a canal. However Yugi stood-up for Joey and Tristan, when they were attacked by Ushio, claiming that they were his friends, whereas Ushio claimed he was protecting Yugi in order to earn money. Joey and Tristan came to be Yugi's friends after the incident and Joey recovered the piece of the Puzzle. After solving the Millennium Puzzle, Yugi unknowingly beleives he's become a whole new, determined person, & beleives he's connected minds with the spirit of Pharaoh Atem, whom he later on learns that he is the desendant of! He soon got himself a few dinosaurs, one of them is a Torosaurus wich became became his favorite & first dinosaur. He's named it the Dark Magician, after his favorite Deul Monnsters card. Now he's got a new goal ahead of him in becoming a JFC fighterr. He's been in 1 tournament. But he never won it. He wishes to go back in & try to win one for his family & friends.